TheGivingMachine charity is based on a simple but powerful idea – making giving free and easy for you. You buy online from participating shops (there are over 2,000 like like Amazon, Sainsbury’s, eBay and John Lewis). Your purchase automatically generates a sales commission. Happy Days! As a charity and not-for-profit organisation, we turn the commission you’ve generated into a charitable donation and pass it on to YOUR chosen school, charity or community organisation. You’re in control and decide which causes you want to support. 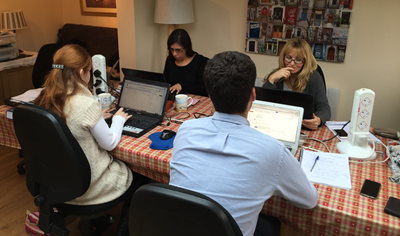 Here are some of the team (Luisa, Gina, Rachel & Sam) in our Bishop's Stortford workspace working hard to support TheGivingMachine community.